Recently, Apple introduced the third-generation of the iPad Air. The previous version of the iPad Air was released back in October 2014 and was sold at Apple’s retail stores until March 2017. Then the iPad Air went on a two-year hiatus until 2019. The official name of the third-generation iPad Air appears to be iPad Air and it is also referred to as iPad Air (2019), but to make things easier to understand I will refer to it as the iPad Air 3 throughout this article. The iPad Air 2 was the first iPad to have the Touch ID fingerprint sensor. The dimensions of the iPad Air 2 is 9.4 inches height x 6.6 inches width x 0.24-inch depth. And the iPad Air 3 is slightly different at 9.8 inches height x 6.8 inches width x 0.24-inch depth due to the difference in display size (more on that below). The Wi-Fi version of the iPad Air 2 has a weight of 0.96 pounds compared to the iPad Air 3’s one pound weight (Wi-Fi version). The iPad Air 3 still uses the Touch ID fingerprint reader rather than Apple’s Face ID facial recognition security system just like the iPad Air 2. And the iPad Air 3 still has a 3.5mm headphone jack for audio. For charging, the iPad Air 3 still uses a Lightning connection so you should definitely keep your extra Lightning cables around. Some consumers may be thrilled by this, but others would have preferred USB-C. In terms of sound, there are two speakers at the bottom of the iPad Air 3 (like the iPad Air 2). The iPad Pro 10.5 — which was released in 2017 — has better sound as it is powered by quad speakers. The iPad Air 2 has a 9.7-inch display (2048×1536 resolution at 264 ppi) whereas the display of the iPad Air 3 has been bumped up to 10.5-inch (diagonal) with a 2224×1668 resolution (264 ppi). With the 10.5-inch display, the new iPad Air actually seems like a lighter version of the iPad Pro. Inside of the iPad Air 2 is the Apple A8X system-on-chip with 64-bit architecture and Apple M8 motion co-processor. And the iPad Air 2 has 2GB of RAM. The iPad Air 3 has been bumped up to A12 Bionic with 64-bit architecture and the M12 motion co-processor. This makes the iPad Air 3 about three times more powerful than the iPad Air 2. The front-facing camera on the iPad Air 2 is 1.2-megapixels at 720p (f/2.2 aperture) and the rear camera is 8-megapixels (f/2.4 aperture). The rear camera on the iPad Air 3 is essentially the same as the iPad Air 2, but the front-facing camera has been significantly bumped up to 7-megapixels (f/2.2 aperture). The iPad Air 2 is available in 16GB, 32GB, 64GB, and 128GB options. And the iPad Air 3 is available in 64GB and 256GB capacities. The iPad Air 3 is available in silver, space gray, and gold, which is the same as the iPad Air 2. 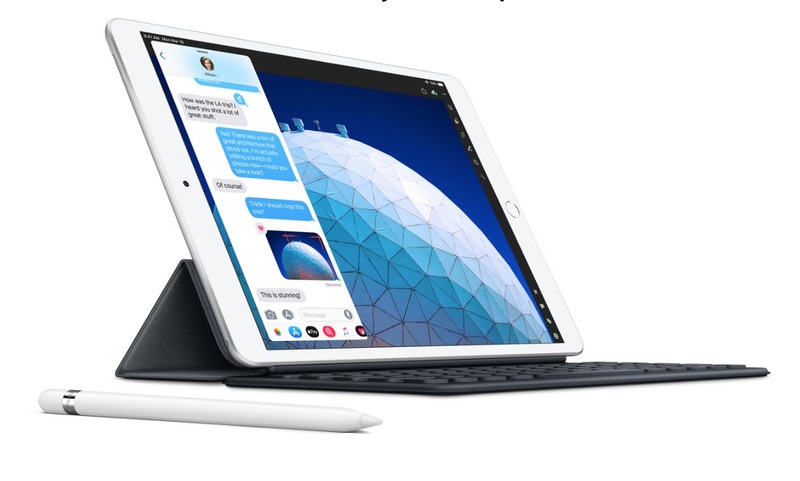 The Apple iPad Air 3 is compatible with Apple’s Smart Keyboard cover and the first-generation Apple Pencil (not the second-generation Apple Pencil). This gives the iPad Air 3 a leg up on the iPad Air 2. To power the Apple Smart Keyboard, iPad 3 has a Smart Connector. The iPad Air 2 has Bluetooth 4.2 built-in. And the iPad Air 3 has been upgraded to Bluetooth 5.0. The price of the iPad Air 3 is set at $499. This was the same starting price of the iPad Air 2.